Today was my half-day at work - I spent it doing the first part of the annual testing on the computer. I was going to mow after work, since I'll be out of town this weekend, but it poured rain all day so I was forced to rest and that was probably a good thing. I made a few phone calls - the ISP can't do anything about all the virus junk emails, I can board the dog over the weekend, and our homeowner's insurance is as low as it can get. If I let them know after we replace the roof, they'll insure the new one - they cover them now. It's cool and dark and rainy and I tried to take a nap this afternoon, and Abby came and lay on my legs and went to sleep. Then Jethro had to get in on it. He managed to lie on both of us simultaneously. Abby took refuge on the cat tower and I gave up on the nap. Bless him, he really is The Great Collector and Protector of Kittens. He loves them and they love him. Abby and Hunter both seek him out to cuddle and play, and he happily grooms each of them every day. 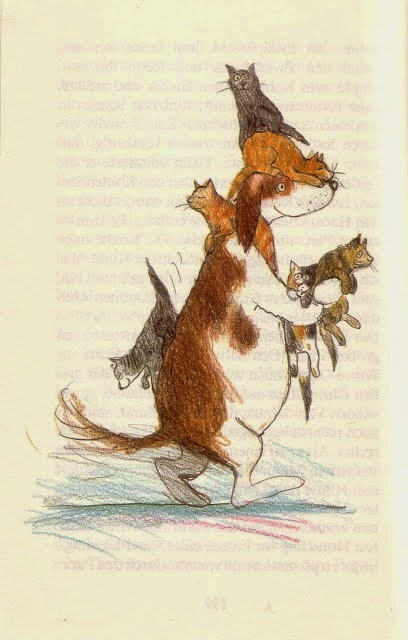 I found this drawing today - this will be Jethro a few kittens from now. At the rate the feral cats in the neighborhood breed, and the talent he possesses for finding the abandoned runts of the litters, I don't believe this will be in the greatly distant future. We rescued him, he rescued them, then they all rescued me. Your little family continues to love and look after each other in your absence. And we all miss you very much. At a minor-league baseball game. John the Baseball Umpire is focused.